These tips make shaping and drying handles a piece of cake! Making handbuilt handles can be a pain and drying them even worse! But, making handbuilt handles has never been easier with these two tips utilizing a cardboard tube and a pool noodle. Andrea Hansen shares her ingenious tip for building the handle, and Nancy Grenard has an inexpensive way to shape and dry her handles. So without further ado, take it away ladies! – Jennifer Poellot Harnetty, editor. 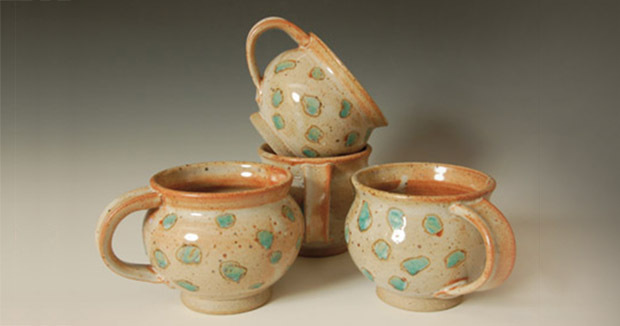 There are as many ways to make handles as there are ways to make pots. You can roll them, pull them, pinch them, mold them, extrude them, but have you ever tried shaking them? To make this simple clay handle, start by preparing a clay coil approximately 3⁄4 of an inch in diameter and 5 1⁄2 inches long. This is a width and length proportional to the size of handle I will need for my particular pot. You will need to adjust your coil accordingly and will be able to determine this with ease after practicing the technique a few times. 1 Roll a 3/4x51/2-inch coil. 2 Insert the coil into the bottom of the tube. 3 Shake the tube, flip, shake again. Make sure that the clay is not sticky. Insert the coil into one end of an 11-inch cardboard paper towel tube. The narrower the tube, the more slender the handle will be. Place your hands around the circumference of the tube at the end you inserted the coil, and hold the tube at an upward 45° angle. Quickly shake the tube in an up-and-down motion for 8–12 seconds until the clay reaches the opposite end of the tube. The clay is likely to fly out of the tube the first time that you try shaking. After a little practice, you will be able to feel the clay moving within the tube. Stop and turn the tube so that you are holding the opposite end where the has clay moved to. Repeat, switching sides and shaking the tube until you see the clay has stretched to about 1⁄2 of an inch from the ends of the tube. 4 Remove the shaped handle. 5 The shaped piece is now almost 10 inches in length. 6 Curve and shape as desired. Photos: Denise Jill Marshall. 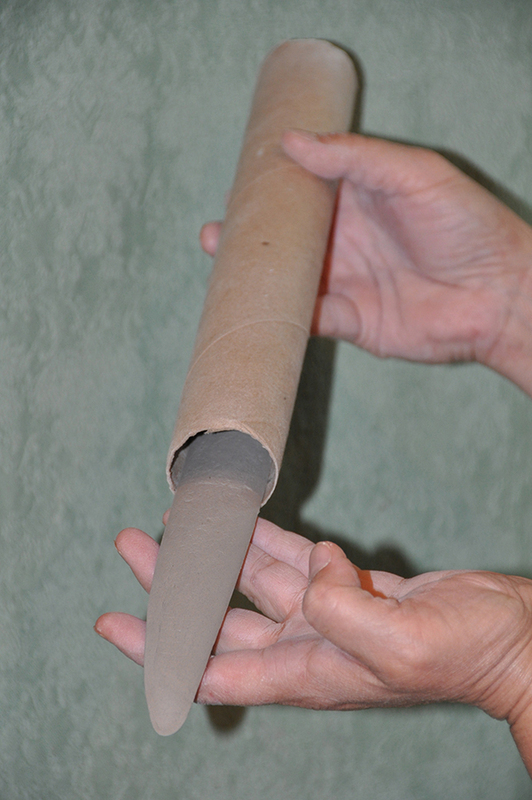 To remove the clay from the tube, hold the tube almost straight up and gently shake it out into your hand. It will look like an elongated madeleine pastry that’s approximately 9½ inches long. Shape the ends and body as desired and allow it to set up before applying to the pot. I put a little bead of clay under the tapered ends so that the handle dries straight. I use a section of a pool noodle with slits cut at each end to fit over a cheap waste basket with a thin rim. It’s handy for allowing handles to set up a bit before attaching and also allows me to pull several at once with a convenient place to lay them. How come when I try to download clay workshop handbook I get 5 great pottery decorating tips instead? Quite disappointing!